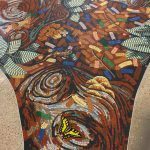 Stanford Hospitals commissioned this project as the second phase of the major artwork commission for their new Stanford Lucile Packard Children’s Hospital. 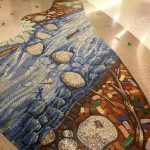 We created phase one for the ground floor entrance lobby, a series of mosaics on the theme of ‘A Walk Along The California Seashore‘. Here Gary describes the process of creating this children’s hospital artwork project. 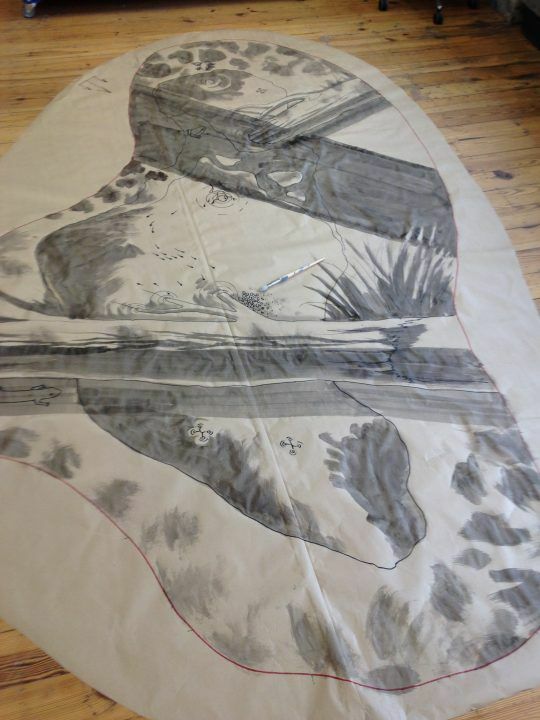 Struggling to imagine how to represent the tallest trees in the world, on the floor? 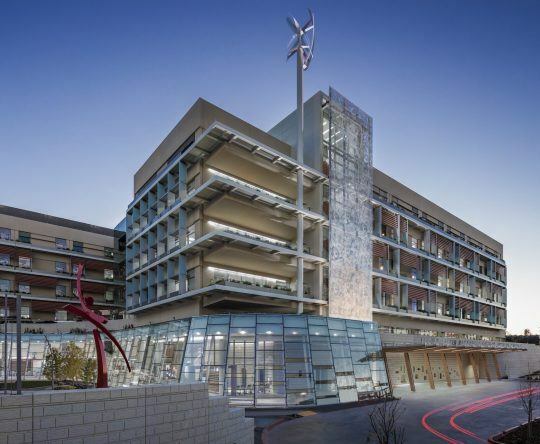 Design by Perkins+Will architects, the Lucile Packard Children’s Hospital is a flagship environment for the care and treatment of Children. The hospital also illustrates just what can be done within interior design for caring environments with the use of art as a central feature. Aesthetics Inc art agents were crucial in the inclusion, integration and organising of art into the hospital. 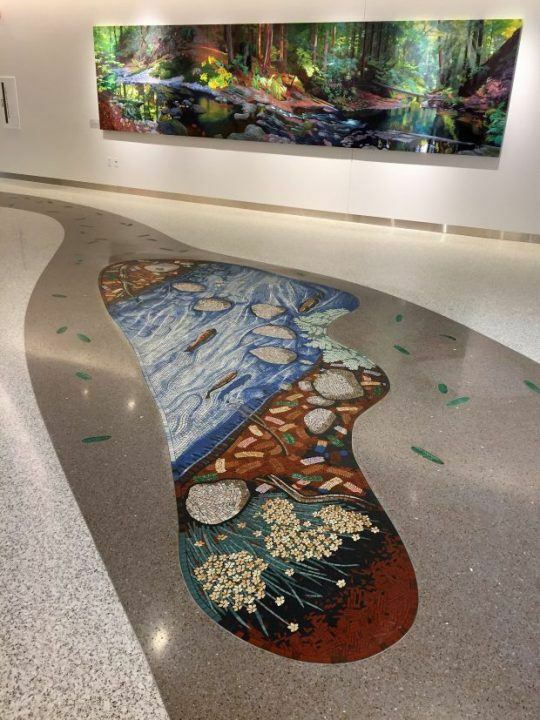 All the children’s hospital artwork is theme linked to altitude, so that the ground floor represents sea level, the first floor became the Redwood Forest level and so on. California’s unique Redwood forests occupy a small band of hillside along the coast where they depend entirely on the incoming sea mist for their water. Whereas developing the children’s hospital artwork designs for the ground floor came quite naturally the first floor proved more difficult. How could I portray these huge Redwood trees flat on the floor? More importantly how could I make this work in the context of a children’s hospital artwork? My initial sketches were unsatisfactory. When designs aren’t going well it is usually best to step back to the source, therefore I decided to take some time and simply wander through the Redwood Forests. I spent a week drawing, painting and photographing the environment mainly around the stunning Big Basin Redwoods State Park. At the same time I began researching the flora, fauna and ecology of the area. Going back to the source proved to be a breakthrough. 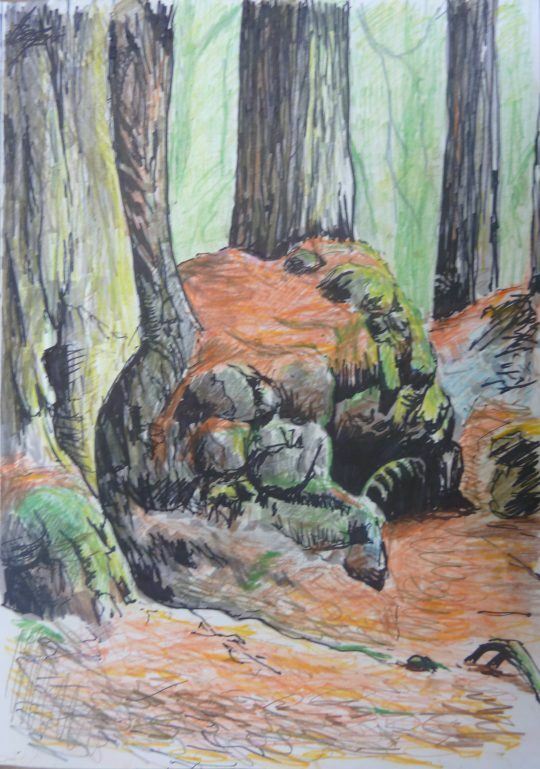 I became fascinated by the intense red colour of the forest floor while I was painting. This fascination together with experiencing the unique movement of following a forest trail led to a new design idea. Visitors can wander through the wide open lobby area on the hospitals ground floor in any direction, as we do on a beach, however the first floor was a very different space, a long corridor. 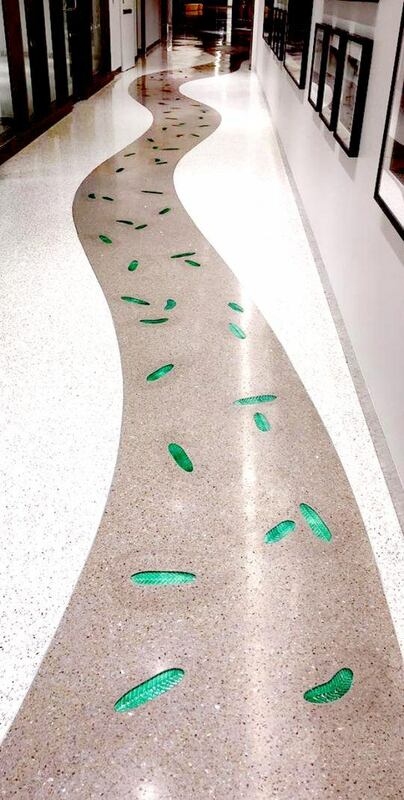 So the idea of a trail through the forest fitted the children’s hospital artwork perfectly. I remembered the movement of a winding trail through the forest. Children love to follow meandering paths, so here I imagined children could follow the long and winding path discovering different aspects of the flora and fauna of the forest floor. The image opposite shows the plan of the first floor with the terrazzo and mosaic panel designs running along the long corridor. 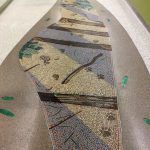 A meandering narrow terrazzo pathway speckled with cast glass leaves connects the nine mosaic panels. 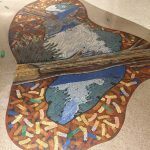 This mosaic project would not have worked if I hadn’t had control of the terrazzo design for the entire floor. 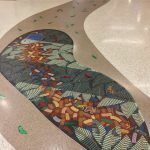 I designed the terrazzo as a meandering narrow path along which the mosaic panels would be spaced. To enhance the pathway I also designed cast glass leaves that would be sprinkled along the path. 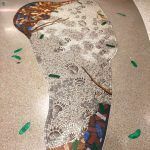 Hundreds of specially made cast glass leaves were made and subsequently set into the terrazzo to visually link the mosaic panels. 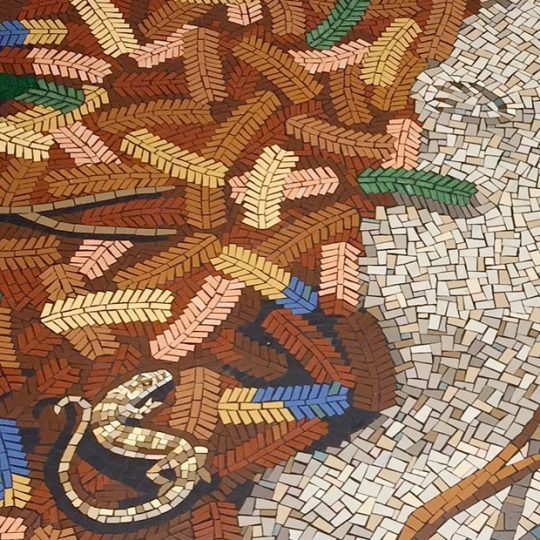 A key part of the mosaic design was determining how the forest floor would be represented in the mosaic. In the forest the leaves fall to the floor green, and as they age and decay their colour changes. Leaves transform from green to yellow, to orange, to red and then on to brown and black as they finally decay resulting in a rich and complex floor pattern. This complex pattern needed to be simplified and developed into a pattern that could be repeated across all the panels. In addition to the basic pattern I wanted to create a feeling of light and dark shadow across the forest floor, therefore an alternative shadow palette was designed which contained blue to help lift the colours. 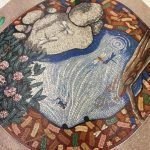 Once the designs for the children’s hospital artwork were approved the process of making the mosaics could begin. The first task was to prepare templates for the mosaic panels, this was important because the mosaics needed to be co-ordinated with the terrazzo floor. Rigid panels were cut for each panel and from this the mosaic cartoons were drawn up. Full scale cartoons are produced on paper, they are then marked with registration details and the design transferred into mirror image. We create a mirror image is because the mosaics are made back to front, the tesserae being glued face down onto the paper cartoon. 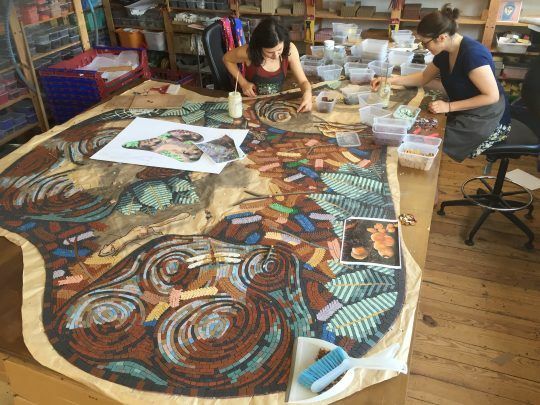 All the mosaic were made off-site in my studio in London with help from my team of expert mosaic makers, Claire Notley, Giulia Vogrig and Marilu Palmieri. Each tesserae was carefully cut by hand and glued onto the temporary paper cartoon. We constructed the mosaics panels from unglazed porcelain with the addition of some vitreous glass mosaic. Using glass for the green leaves, to tie in with the cast glass in the pathway, and for the butterflies. Constructing these mosaic panels took approximately a year. Marc fixing the leaf blanks to the floor which formed the spaces for the cast glass. 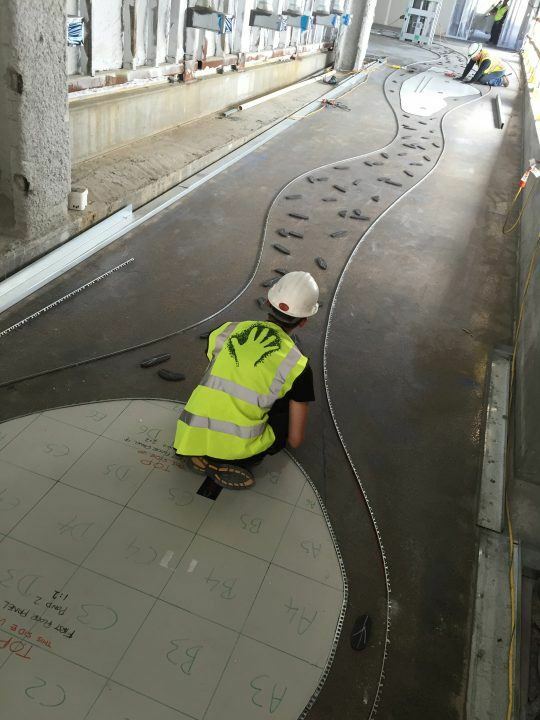 Our first task on site was to check the terrazzo layout. Following this we laid out the templates for the mosaics and the cast glass leaves. We had to make sure that all the elements worked together. We fixed the template panels and leaf blanks to the floor as the terrazzo company TB.Penick, from San Diego, fixed the terrazzo steel dividing strips. 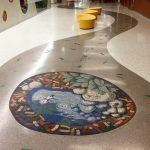 The terrazzo company was able to begin the process of laying the terrazzo floor as soon as our work was complete. 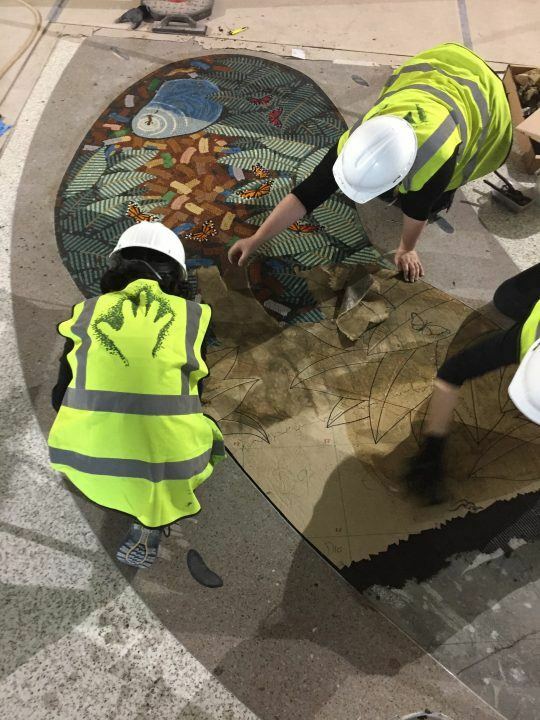 Returning to the site some weeks later our next task was to install the mosaics and the glass leaves. In an ideal world that would be the whole story. But in reality the task involved careful co-ordination with the many other contractors on site all competing for space to complete their own works. Consequently we worked on small sections of the corridor at a time, working our way from one end to the other, fixing, grouting and cleaning each section before moving onto the next. 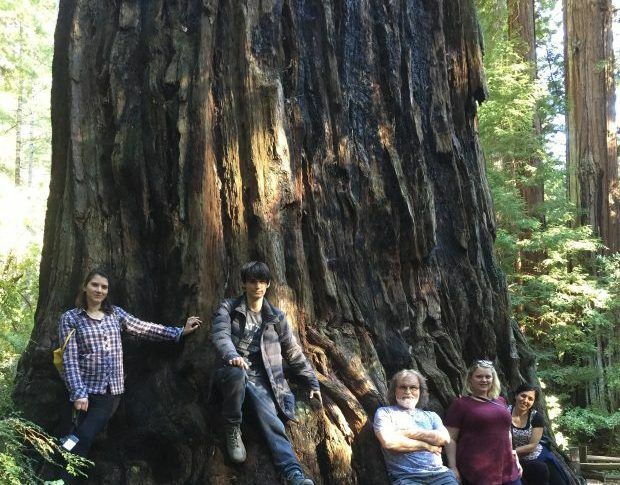 From the initial contact to the final completion these two projects, ‘A trail through the Redwood Forest’ and ‘A walk along the California Seashore‘, took seven years to realise. This might seem a long time but being brought into the project at such an early stage and being able to connect with the architects and develop ideas together meant that the work could be fully integrated into the building. 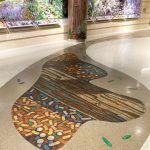 For me being able to design the terrazzo floor created a single work from what could have been just a series of panels. It is rare that this level of integration and co-operation is facilitated in a building project, but I think that the benefits of such an approach are clear. 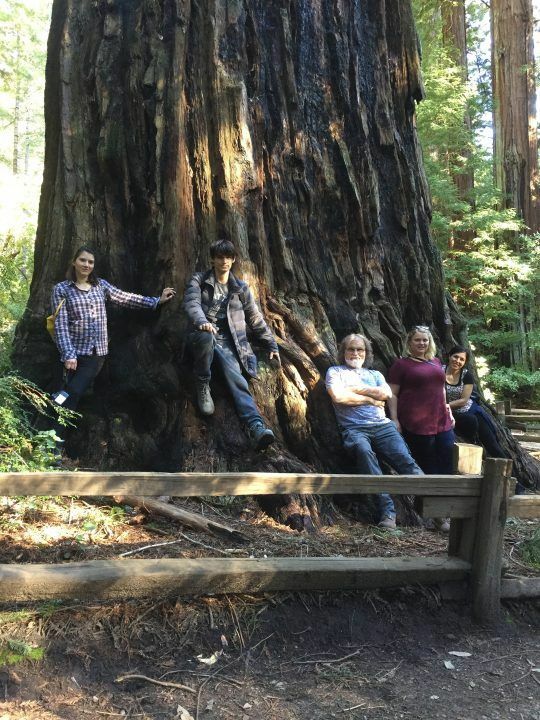 Drostle Public Arts team in the Redwood Forest at Big Basin. L to R: Giulia Vogrig; Marc Drostle; Gary Drostle; Claire Notley; Marilu Palmieri.